For installing CWM on your Micromax Funbook you will first need to download it. Download it from this link. After you have downloaded the ZIP file extract it on your PC. Open the ADB_Drivers folder. You will find 2 ZIP files. Now, If your PC is 32-bit the extract the 32-bit ZIP file and if your PC is 64-bit then extract the 64-bit ZIP file. We will use the extracted folder later in this tutorial. You have to use the USB data cable provided with your Micromax Funbook to connect it to your PC. But before you connect it. Enable USB Debugging on your tab. Go to Settings > Developer Options > Turn On USB Debugging. Now we will increase the screen sleep timeout so that we can prevent the screen from getting turned off in the middle of the process. Go to Settings > Display > Select Never at Sleep. Now you are ready to connect your tab to your PC. After connecting you will see that your PC will be finding drivers for your tab. It will fail, but this is not a reason to worry. DO NOT TURN ON USB STORAGE. While keeping your tab still connected to PC, press the windows key + R. This will open the Run dialogue box. Now, type devmgmt.msc. This will open the Device manager. 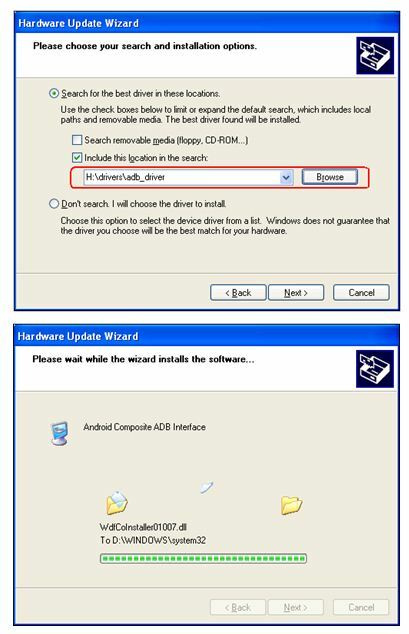 Browse to “Unknown Device” and right click on it and choose Update Driver Software. After you click Update Driver Software you will see a new window. Now click “Browse To Find Driver”. Point it to the folder you extracted earlier in this tutorial. Choose between 32-bit or 64-bit as per your PC. Installing will take about a minute. Installing CWM Recovery 5 Finally after completeing all the above written steps we will now install ClockWorkMod Recovery 5 or CWM Recovery 5 on Micromax Funbook. Open the Recovery-install.bat in the extracted ZIP folder. You will see a screen like this. Press any key to continue. The next screen will look like this. Now press 1 and CWM Recovery 5 will install without any problem. To check if the CWM Recovery 5 has installed properly reboot into the recovery mode. Now, disconnect the tab from the PC and shut it down. To reboot into recovery mode first press the options button and then press the power button simultaneously. Both buttons are to be pressed at the same time until you see the Micromax’s new fist logo.